I have received my first two Noodler’s inks from you (Nikita and Heart of Darkness). Both with an eyedropper. That makes your responsible in me liking this “technology” :D. Both pens are OK, but the nib is too small for me (I am the medium to broad guy) and the quality also isn’t the best. I love the ink in the pen body and how it moves there back and forth. The capacity is not that important for me as I plan to use them only in the office with the ink bottles in my drawer. I know I can have this effect also with an piston filler, but it doesn’t feel the same (I know, I’m weird). Can you give me some tips which pens are the pest for an eyedropper conversion. The pen has to be a clear demonstrator as I want to see the ink and the colors. 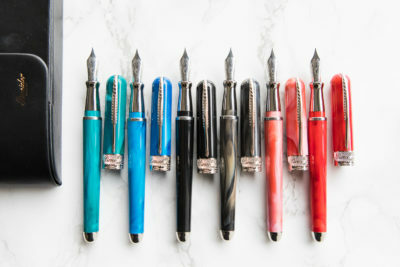 It should have the “classic style” nib (TWSBI style and not Lamy or Preppy style) and be available in different sizes (mainly M). The nib should be very smooth of course. I do not want to convert an expensive pen, so I think, the price limit should be EUR 50,00 (ca 65 – 70 USD). Do you think you can point me in the right direction? Yeah, the free pens that come with those inks are okay, nothing to get too excited about (except watching that ink slosh!). You can see all of the eyedropper-convertible pens we have here. It sounds like you want something with a clear body though, and that narrows the search quite a bit. I think the pen that would have pretty much everything you want would be to get a Noodler’s Clear Ahab which comes with a flexible nib. Converting it to eyedropper is easy, I have a video on that here. 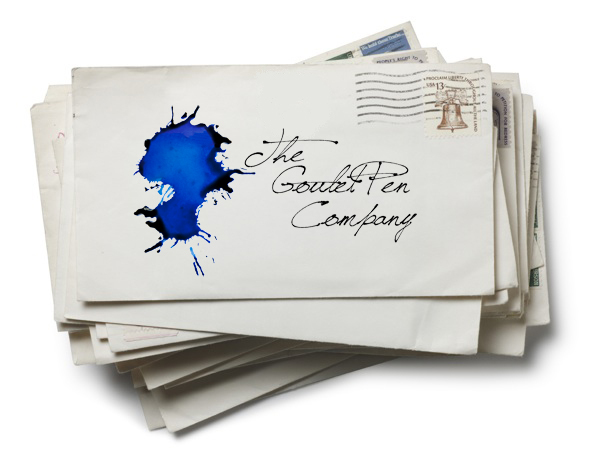 You should then get a Goulet nib of your choice, and put that in the pen instead of the flex nib. It’s easy to replace, video here. That would give you a clear pen with a beautiful ink-sloshing body, with a reliable conventional nib for a total investment of $35. The Habana A4 in blank is currently the only A4 bound notebook from Clairefontaine/Rhodia/Quo Vadis in the US. There is an A4 Rhodia Webnotebook in France, but they’re not imported into the US. We looked into it, but the minimum quantities are too high for us, and the notebooks would cost around $45 each! So currently, there is no Rhodia A4 in the US, the Habana is only in blank, and Apica doesn’t have a pocket. There is always the Leuchtturm1917 Master, that might meet all your criteria. The paper isn’t quite as good as the other brands I just mentioned, so that’s a compromise. Any advice on an elegant way to fill a cartridge converter from that narrow opening in the Noodler’s 4.5oz bottle lids? I’m thinking of using a syringe and just injecting ink into the converter. Also, what do you do with the eyedropper to keep them from making an inky mess when you set them down? Well, there’s pretty much two ways you can go about it. One is the ink syringe like you mentioned, and I have a video on how to do that here. The other way to do it would be to take something like an ink sample vial and fill that with your eyedropper, then fill your pen from that. The neat thing about this method is 1) you don’t need an ink syringe, so you have having to clean that out or even buy it in the first place, and 2) you can fit a lot more ink the sample vial than you’ll use on one pen filling, so you can use and reuse that one vial to fill your pen, so you’re having to open up your bottle less. Whenever you’re working from a large bottle of ink, it’s never a bad idea to use a smaller vial or bottle to fill from more regularly, so that you’re keeping the large bottle ‘contaminated’ as little as possible. That’s one advantage, but the more tangible benefit is that you will only have to use the eyedropper to fill your vial once, and you’ll be able to fill your pen probably 10 times from that vial before you need to refill it. As for the dropper itself, if you’re filling a separate vial, then you won’t ever have to set it down…problem solved! Otherwise, there’s nothing magical, you’ll just need to put something like wax paper, a thick wad of paper towel, or something else to keep the ink from getting on whatever you set it down upon. How do you flush the Platinum Preppy with a marker tip or highlighter tip or do you just use the tip until it is unusable and replace with a new tip? Well, it’s sort of a felt material so it won’t flush out like a fountain pen will. The pen itself can be, but the tip won’t clean so easily as a fountain pen nib. It won’t be as easy to change colors like a fountai pen, you’ll pretty much have to change tips. One thing you can try is to soak the tip in water (or maybe a 10% bleach in water solution) to clean it overnight. Brian, is there a package of ink samples in the color black that are a mixture of water based and waterproof ink? As an artist the difference is crucial and very important. I am looking for a package like so on the site but, have not come across one. If not, what are some conventional inks would you recommend, this will minimize straining my brain looking for a particular one in this abundance of inks. We don’t have a sampler pack of both waterproof and non-waterproof black, I’m sorry to say. We have one just of waterproof, so you can look at those and see what is most appealing, then I can recommend some conventional ones if you’d like. Or, if you want to search for yourself, you can go here to see all the black inks we have, go here for water resistant ones, and you can then deduce which inks aren’t water resistant. Many artists revere Platinum Carbon Black as the best black in to use if you want waterproofness. Some good conventional blacks would be J. Herbin Perle Noire, Monteverde Black, Lamy Black, Aurora Black, and Pelikan Edelstein Onyx.